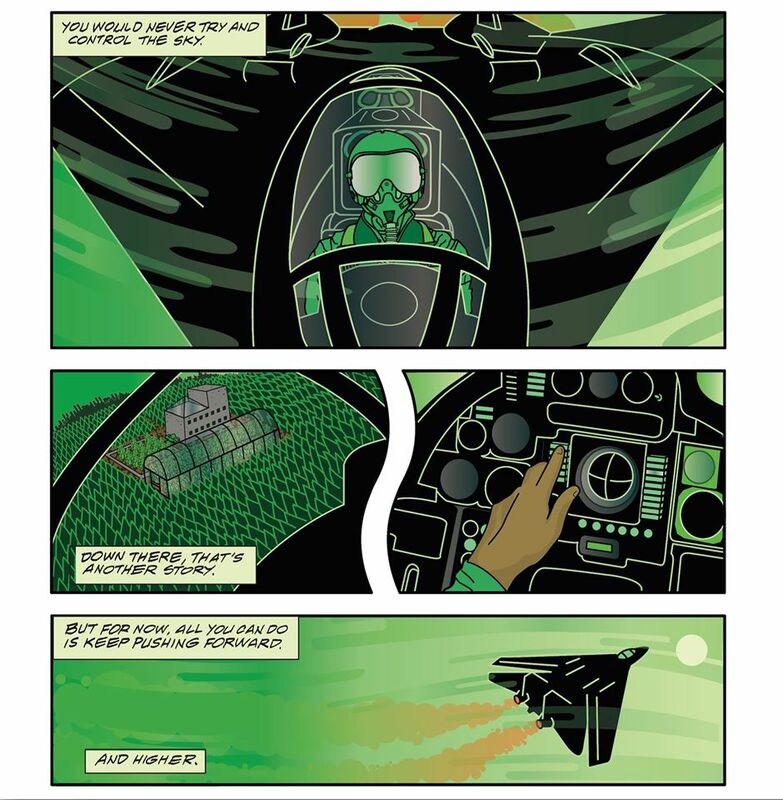 A project first begun by the artist and friend David Barnett, Green Sky is a stoner comic series focused on the tale of The Pilot, a young man with his heart in the sky but his eyes on the game. Inspired by Barnett's concept and art for the rapper Curren$y's Pilot Talk I album, in which a fleet of jets are pummeling a stadium with cannabis plants, that album was first developed by writer Kevin Bennett along with Barnett into a 18-page draft. Needing a more involved story, David, who had first proposed the project to me the year prior and I declined, showed me the draft and bowled over by the highly-detailed artwork and somber tone, I was compelled to join. Green Sky Issue #0, cover art by David Barnett. Intrigued by the existing concept of the lonesome Pilot who plants the titular Green Sky strain of cannabis around the world, I developed the property apart from what was already on the pages and conceived a grander narrative arc. As I was faced with inheriting the majority of already-drawn (and gorgeously so) comic, I ended up reworking the entire story to fit the grand scope of the artwork. As many of the panels were not explicitly plot-driven, we re-conceived the issue as something of a poetic prologue in which we are immersed in the hazy world of The Pilot, a corner boy whose lifelong obsession with flight belied a far greater ambition: to dismantle the drug industrial complex. Believing cannabis to be the greatest gift known to human, Issue #0 sees The Pilot's come-up, from dealing dime bags on the corner to poaching future PhDs to help him develop Green Sky, comprised of Indica, Sativa, and Ruderalis strains, each enhanced so as to enable the plant to grow anywhere it chooses while providing the user with the single greatest high known to mankind. Barnett's Pilot Talk cover art that served as the launchpad for Green Sky. Of course, making drugs free means a lot of powerful people lose a lot of money, and going forward, Green Sky will embark on a sweeping epic, exploring the salient problems posed by Big Pot, Big Pharma, and every government agency sworn to protect the American people alongside the contemporary debate about cannabis' medicinal and recreational properties. Inspired by the likes of Herge, The Right Stuff, Japanese psychedelia, Transmetropolitan, Moebius, and innumerable rap songs--special shout-out to "My Mind Playing Tricks On Me" by the Geto Boys--writing Green Sky has been the single greatest challenge I have ever faced as a writer, tasked with translating David's and my many ideas and inspirations into a cogent visual narrative. I am currently nearing the end of Issue #1, and have a three, possibly four, issue arc charted out. David and I self-published the first issue, but are beginning to reach out to publishers while also tweaking the comic's style and voice, exploding the narrative authority of The Pilot in the first issue to include a whole multitude of characters. So check out Green Sky online and keep an eye on this space as I feel this is just the beginning of something truly exciting. Thanks to everyone who has supported this project so far. Green Sky on the racks at Desert Island in Brooklyn, NY.